MICHAEL FRUSTRATED CROWL will be my name from now on. At long last I got something positive from the Ballet – and even then it was at second hand (via Anne). No go – well, I’m afraid that I feel rather relieved about that – Ballet’s not really my line and since even the Ballet dancers would have known the music better than me, I think it might have been a little risky. [This is bit of nonsense, of course; no ballet dancers, any more than opera singers, know all the music of all the repertoire.] So, I’m not over-worried about that. More relieved than anything to have something positive at long last. That’s not where the frustration bit comes in! 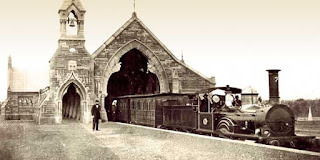 Rookwood Mortuary Station - not when I was there! Well, I got a through train from Wollstonecraft (at Northwood end) to Lidcombe, which took me nearly an hour, so that it was about 4.15 by the time I got there. [I remember this trip: mile after mile of suburbia passing by, a sight I wasn’t to see again until I reached London.] I had planned to get back to Northwood for tea! Well, I went into the cemetery, (which is just down the road from Lidcombe Station) and found section 13 sitting right there. But apart from a section 5, everything else was labelled A, or G, or EE! I discovered later that this was the old part of the cemetery. Well, I trekked around for a while and finally asked a lady in a house that was sitting right in the middle of this bit if she knew where sect. 17 was? She didn’t! So after losing myself thoroughly in this place I finally came upon a sign saying ‘Catholic’ – this was the new part, I presume, though some of the stones had been there for years. To my joy (it was now about 5.15!) I saw some small name-plates that looked like the thing I wanted. But these only went up to 1050 or so. I then went right round that area and found every section (18, 16, 20, 14, 15, 10 *!!!) but the one I wanted. And there was absolutely no reason to it all. So if ever I get the chance again I’ll try again. But I wasn’t finished yet. I took the road that I thought I’d come up, but all it would do was insist on taking me in a completely unfamiliar direction. As far as the eye could see there were graves, or bits of unrecognisable countryside. You’ve no idea what an odd feeling it is to be completely and utterly lost (I couldn’t find one of the churches I’d seen on the way in) in a cemetery just before sunset. Fortunately, a car came tootling around the road I was on, and I waved them down and asked how to get to the station, explaining that I’d got lost on the way through. They very kindly pointed out the direction and were about to drive off when they realised I didn’t have a car. So they gave me a lift to the station which had somehow transplanted itself a good two miles away from where it had been before. AAAAGH!! Why don’t they put up some sort of signs of where sections are, etc? Of course, by the time I got to the Catholic Office in the grounds everyone had gone home. So when I got to the station, I rang up Anne and said I couldn’t make it home for tea and get to Rigoletto, (it was now 10 to 6) so I decided to have tea in town (which didn’t bother her a bit) and meet her at the theatre. Got another letter from you, Hurray!!! * You can see a sketch of one of the sets built for Rigoletto here. The picture is copyright, so I can't reproduce it.